Professional paint sprayers are top quality units used by professional painters to handle large scale projects. They are meant for professional use and aiding its users attain high-quality finishes for their projects. They can be used by painting experts and DIY enthusiasts to achieve quick and versatile results even for large projects. 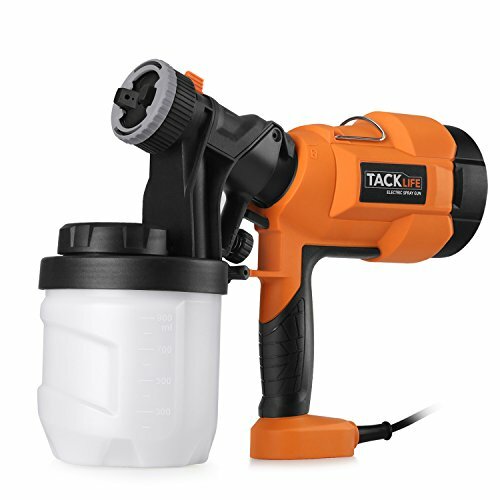 Most of these high end paint sprayers are made by reputable companies and features quality construction, long warranty periods, and reliable operation. You can use these type of sprayers for a very long period of time without experiencing severe malfunctioning. Most of the professional sprayers have sports wheels to enhance portability. They have the capacity to handle a large project such as painting walls or even the entire house. Choosing a professional sprayer is not easy because in most cases you may not understand all the things that need to be considered. Considering the high cost associated with these sprayers, it can be quite frustrating to buy a unit that doesn’t conform to your needs. In this article, we have explored some of the things you need to consider before buying such a unit to help you maximize productivity. The paint sprayer has the capacity to pump out up to 0.27 gallons per minute without thinning out. It comes with a fully adjustable pressure mechanism which gives you ultimate control of painting for any project size. 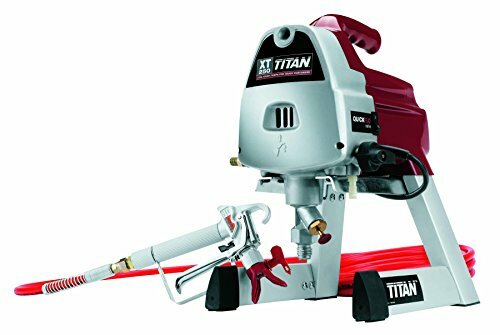 The Titan Impact 440 High Rider Airless Sprayer is an amazing product from a popular and reliable titan paint sprayer manufacturing brand. It is ideal for your interior design projects, fences, deck or minimalist houses. What’s the best part? It’s durability. 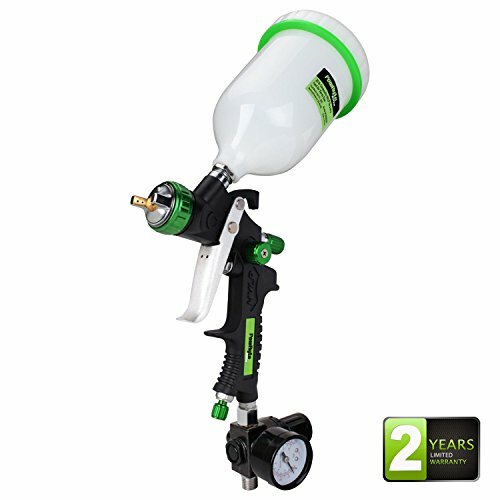 The sprayer features a fully adjustable pressure system that gives you the overall control over your painting project. This unit offers a combination of high performance and versatility that lays down a professional finished look. 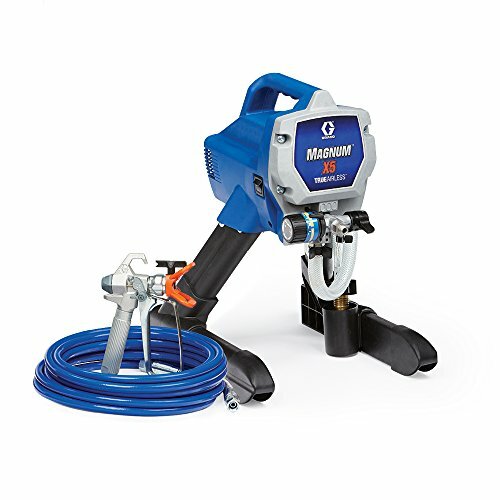 The Graco Magnum 262800 is a painting tool for around $300 made by leading brand in the paint sprayer manufacturing industry. The paint sprayer comes with the SG2 metal spray gun which has an in-handle filter that blocks debris and prevent tip clogs. This ensures that the painted surface is always smooth. Furthermore, the paint sprayer comes with a Stainless Steel Piston which allows paint to be sprayed effectively at a high pressure. The paint sprayer has the capacity to pump out up to 0.27 gallons per minute without thinning out. Moreover, it can support up to 75ft of paint hose which gives extra room for efficient spray painting. In addition to these, the product comes with a push prime button which allows a quick and reliable startup. It also comes with an adjustable pressure control feature which allows you to choose between “Low Spray” and “Hi-Spray” mode. There are several benefits of acquiring the Graco Magnum 262800 paint sprayer and one of them is that its stainless-steel piston ensures that it is durable and reliable. 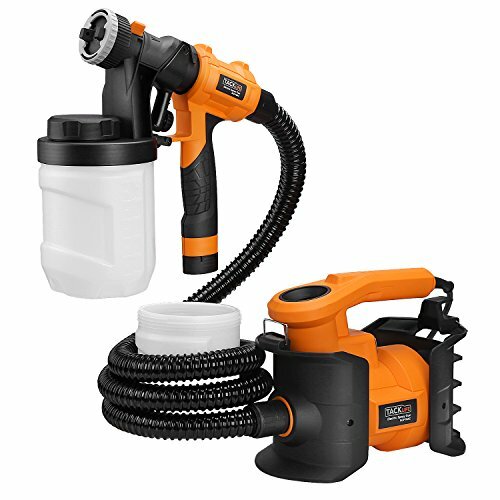 Moreover, it comes with a power flush adapter which allows it to easily connect to a garden hose for easy cleaning. Furthermore, its construction and features ensure that it can spray different types of paint materials ranging from latex to acrylics. The paint sprayer comes with a RAC IV SwitchTips which allows you to reverse the tip in order to continue spraying if it becomes clogged. Moreover, the product is lightweight which makes it incredibly easy to use. The Graco 17G180 Magnum Prox19 Cart Paint Sprayer is an incredible product of graco paint sprayers that combines great design with great capabilities. It comes with a fully adjustable pressure mechanism which gives you ultimate control of painting for any project size. It also comes with pump filtration device which helps separate paint from debris. Furthermore, the product comes with a ProX Stainless Steel Piston which allows paint to be sprayed consistently at an unthinned pressure. Additionally, the product comes with a flexible suction tube which allows paint to be sprayed from either a 1 or 5-gallon paint bucket. The product comes with a PowerFlush Adapter which connects to a garden hose for easy cleaning. Moreover, it can support a paint hose as long as 150ft. This provides extra room for effective spray painting. One of its best attributes is that it has an annual usage of 500 gallons. This ensures that it provides value for money. In terms of performance, the product has the capacity to spray up to 0.38 gallons per minute. This ensures that painting projects can be completed quickly. Moreover, the fact that the paint sprayer is mounted on a cart guarantees ease of movement which ensures that it does not constitute needless burden. The paint sprayer comes with a 7/8 horsepower motor which greatly optimizes its performance. Moreover, its adjustable pressure control feature also ensures that you can choose between low or high-pressure settings which makes this paint sprayer extremely versatile product. The Titan Impact 440 High Rider Airless Sprayer is an amazing product from a popular and reliable titan paint sprayer manufacturing brand. The product is relatively lightweight for a cart-based paint sprayer. This makes it relatively easy to use. Moreover, it comes with a 7/8HP DC Motor which greatly increases its performance. The paint sprayer comes with a manifold filter which helps filter debris from paint material. Furthermore, the product comes with a T-slot piston and a modular design which also makes it easy to use. The paint sprayer can support a paint hose as long as 50ft. This provides adequate space for effective spray painting. 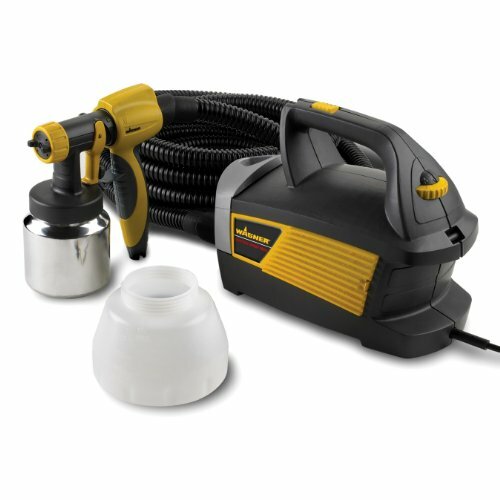 The paint sprayer is priced well under $1500 and comes with an auto-oiler which ensures that oiling can be done simply by pushing a button. This is a substantial advancement when the product is compared with previous models. Moreover, the product is easy to transport from one location to another which greatly relieves the stress involved in painting. Additionally, the paint sprayer is capable of spraying several materials. It is suitable for both small scale and large-scale painting projects. Moreover, the product comes with easily accessible and readily available replacement parts which guarantees long usage. The Graco 262805 z7 is a DIY homeowner’s best friend. This is an admirable airless paint sprayer that provides high-speed performance while being cost efficient at the same time. It is ideal for your interior design projects, fences, deck or minimalist houses. What’s the best part? It’s durability. 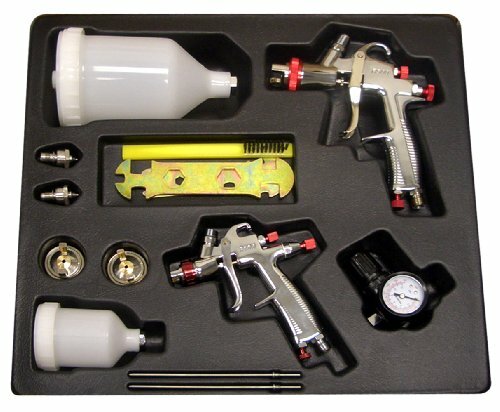 This airless spray paint sprayer is equipped with a long-lasting piston pump constructed from stainless steel. It ensures that you will be able to use it for many years to come. Besides, you will be able to spray an array of coatings ranging from heavy latex to stains with ease. The main features include the adjustable pressure that provides you with the ultimate control over your project- regardless of the project size. The piston pump, made of stainless steel, gives you the chance to spray unthinned at surfaces at a higher pressure. It also features a flexible suction area that enables you to spray directly at your project while utilizing a 1 to 5-gallon painting bucket. The power flush adapter easily connects to the garden hose which makes the clean-up process easier and efficient. At one go, the Graco 262805 x7 cart airless paint sprayer can support 100ft of paint. With that capability, you should be able to complete a three-story home project efficiently. In case of clogging, you can quickly reverse the RAC switch tip and keep on spraying. The pump replacement system helps you to easily replace your pump during a job without any need of tools. It eliminates any downtime ensuring an extended lifespan, more productivity and efficiency. 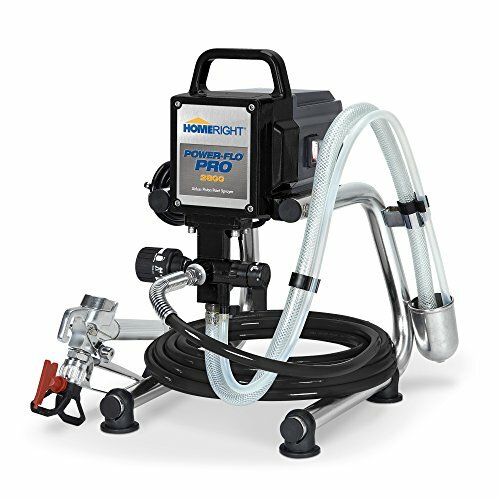 If you are looking for a paint spraying tool under $700 that can revolutionize your project then you should consider the Magnum ProX17 because this unit is the smartest way to complete an excellent painting job. 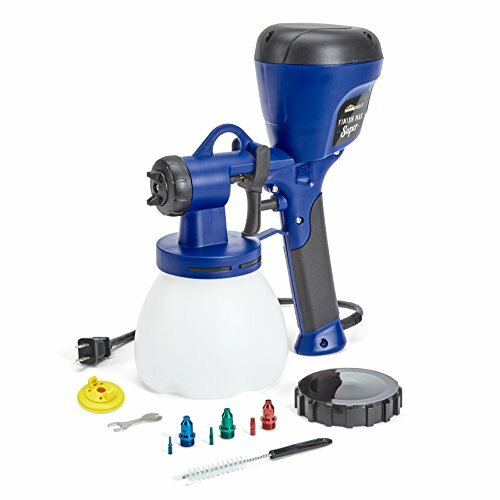 The sprayer features a fully adjustable pressure system that gives you the overall control over your painting project. The Stainless-steel pump ensures durability and reliability. For a faster clean up process, the Magnum ProX17 has a power flush system that easily connects to your garden hose. Using the adjustable pressure, you can control the flow of the paint with the bonus of a compact design that ensures portability around the working site. You can easily twist the tip to clear any clogs. 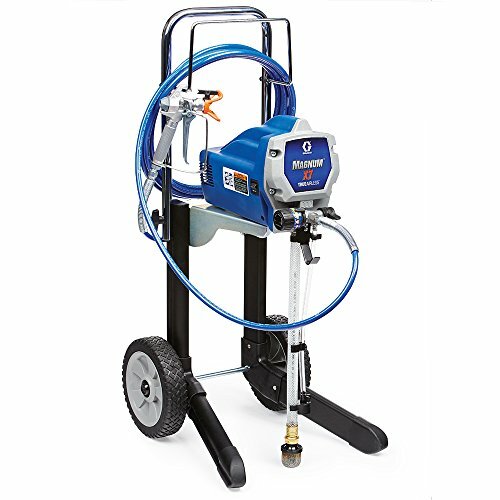 If you settle on getting this Graco 17G177 Magnum ProX17 Stand Paint Sprayer, you can rest assure that you will receive a reliable and highly efficient paint sprayer with fast start-up time utilizing the PushPrime system. The motor supports long extension cords- up to 150 feet. Additionally, the metal spray gun makes it easy for you to manage the long lengths of hose. If you are looking for a machine that delivers top-notch professional results then the Fuji 2202 is your answer under the list of variety of popular HVLP paint sprayers. This unit offers a combination of high performance and versatility that lays down a professional finished look. Its main features include a nonbleed gun that uses just air, or air and fluid together. Therefore, once you release the trigger, the fluid stops flowing and then air. While on the other hand with a bleeder gun, the air will constantly flow from the air cap if the gun is hooked up to air. Additionally, it features adjustable pattern that provides easy disassembling maintenance and clean up. 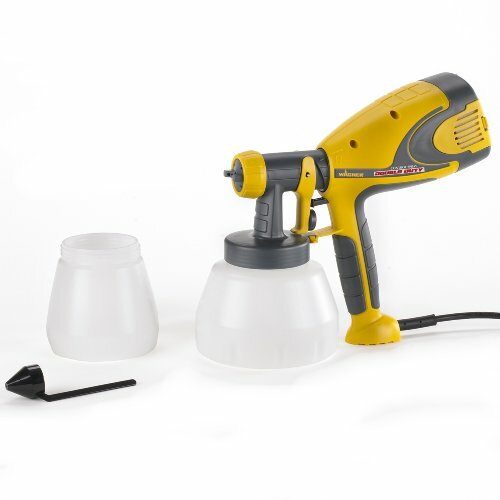 It has multiple air caps that helps in spraying different materials over varied viscosity levels-such as latex paints or others having lower thickness. The sprayer also has stainless steel passages that reduce all chances of wear and tear on the tip of the needle. It is one of the best pick for any solvent based or waterborne coatings. The Fan pattern control in Fuji Spray machine ensures a precise application that has minimal wastage. You can easily carry out a circular, horizontal and vertical applications. Additionally, you can quickly adjust your patterns from 12″ circular to 1″. The sprayer has a 25 ft hose featuring an air control valve that reduces any situations of bounce back or oversprays. The 1.3 cap is efficiently setup with a 400c Gravity suction cup. Moreover, it has powerful super 1400 watts motor housed in a metal turbine with a comfortable holder. This sprayer is ideal for painting any shutters, fences, walls, ceilings, cabinets, furniture pieces or walls. All in all, this model is essential for any professional painter or if you want to see some fantastic spray painting results. Painting contractors and professional painters understand the value of buying a quality professional sprayer. A powerful professional unit should have high feed volume and a spray gun that enables quicker application of paint. When buying a professional sprayer, it is important to understand its features. This enables you to choose a quality product and make an informed choice. There are a number of features that one has to consider before purchasing a professional sprayer. They include horsepower, performance, tip size, sprayer weight, hose length, recommended annual usage, value, cost, volume, dimensions, power flush, and warranty period. To start with, each professional sprayer has the capacity to create a certain level of pressure. Thinking about your painting tasks may help you choose the correct pressure for your sprayer. If you expect to paint the walls of a story building with your sprayer, then you probably need more pressure than when you intend to use it on furniture alone. The next aspect is about performance. If you are a professional painter, then the chances are that you will use your professional sprayer to cover large painting areas. It is therefore important to choose a unit that has the high processing capacity to be able to handle these jobs without straining. The good thing with a high capacity sprayer is that it will always operate below its maximum capacity hence last you longer. Moreover, when purchasing a professional paint sprayer, it is important to think about the number of times you would want to stop and refill your tank. If you are buying a sprayer for home use, then a lightweight model that can hold about 2-quarts of fluid is recommended. If you are going to use it for larger projects, then it is a good idea to go for higher volumes. The cleaning options for the sprayer should be a key factor in your choice. No one wants to spend a whole day cleaning a sprayer after using it. The paint should be easily removed from the machine to minimize the cleaning period. Most professional sprayers have an attachment that allows you to connect to a garden hose and flush out the dirt. You also need to consider buying a unit that is flexible enough to handle several painting jobs. Most professional sprayers have the capacity to tackle jobs related to stains, latex paints, lacquers, and special categories of paint. Additionally, you need to consider choosing a professional tool based on the fact that whether that paint sprayer needs an aircompressor and is able to work well with your painting materials. You should not just focus on the cost aspect when buying a sprayer but rather the usage. The machine should be adequate enough for your materials in order to avoid overloading it. You need to check the manufacturer’s technical sheet to know the details related to material, guns, tips, maximum volume, and maximum pressure. There is also the cost factor to look into. As expected, professional paint sprayers cost slightly more than most conventional sprayers. The cost aspect covers both the initial acquisition fee and the subsequent maintenance fees. Acquiring a low-quality machine may expose you to higher maintenance and repair costs. It is therefore important to maintain a balance between quality and cost. Choosing the right size of a spray tip will help you get the right coating for your projects. Each sprayer has an indication of the highest tip size. A model that has pressure controls is likely to give you better control over its tip. In order to choose the best professional paint sprayer, you have to compare the various models on the market and check the various factors mentioned above. Apart from this factor, there are certain tips that can assist you to choose the right sprayer. The first tip is that you need to regularly practice painting to be able to fully appreciate these features. The more you practice, the more you begin gaining control over the professional sprayer. You then need to understand how sprayer’s PSI and GPM relate. These two have a direct influence on the flow rate and it’s important to understand how the two work before purchasing the sprayer. The number of professional sprayers on the market keeps on growing and it is good to understand the different aspects of these machines to be able to choose the right one. As a professional painter or DIY enthusiast, a professional sprayer will basically make your painting job much easier. Different sprayers have different capabilities and hence the need to pick one that is best for your needs. The best professional sprayer should be powerful and efficient enough to help you meet your painting needs in an easy way. Such a unit will give you impressive finishes. Our buyer’s guide is a great starting point for acquiring a powerful professional sprayer that is able to meet the requirements of your painting projects. As a general rule, you should compare the features presented by the different models on the market before deciding which one works for you. The best choice may not necessarily be the most expensive one.